When we were kids, we looked forward to our parents (or uncles and aunts) coming home - they always had "pasalubong" of some sort. 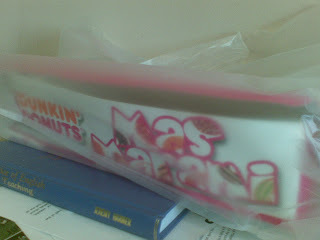 It was a great treat for us when they brought home Dunkin' Donuts. I had forgotten this - until last night. Don't get me wrong - I think it's really really sweet. I loved it. I just found it so funny that there I was, asleep in the middle of the night, trying to lessen my food intake (yeah I am trying to lose weight), and my husband comes home with no less than 15 donuts. He said it was cheaper to get 15 than 12 - a promo of some sort. AND he wouldn't stop till I ate one. At 2 in the morning. Thank God he gave the guards downstairs some - otherwise he would have wanted me to stuff my face even more. That's my doughnut man for ya. "He said it was cheaper to get 15 than 12..." Oh my gosh, that's EXACTLY what my husband says when I ask if we can just get 1 each to minimize the calories. We have the not sleeping till 5am war going on every day...I sympathize with the out at 2am thing...Will they ever learn? Didn't you know that you just can't buy a couple of doughnuts? I think it is physically impossible as there are always too many choices especially the chocolate ones. I have a Worldwide giveaway going on so check it out! You can actually enter one - how about that! 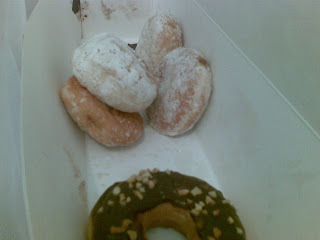 D: I'm doomed - Krispy Kremes is opening in our area, a mere 5-minute walk!